When we discovered these innovative modern door handles that integrate a doorstop within the lever we thought they would make an interesting blog post for you and other visitors to read. A modern design of satin stainless steel door handles that contrasts with the partly visible hard wood doorstop becomes functional once removed for use. Combining style and functionality these door handles are unfortunately still just a concept design but one of several worthy designs of modern handles that were entered into the international Hands on Door Handles competition. Along with the normal function that all door handles provide, we thought that doubling up as a doorstop was a particularly useful idea, better than that of the innovative clip handles we covered in a previous article. If ever produced then we’d have thought the doorstop door handles could do very well, although they do have a couple of small drawbacks of which we shall mention. As most internal doors have two handles (one for either side of the door) unless one of the handles on the door had a fixed wedge fitted within the lever then you’d end up with two doorstops for each door, although perhaps it's a good thing you have a spare. 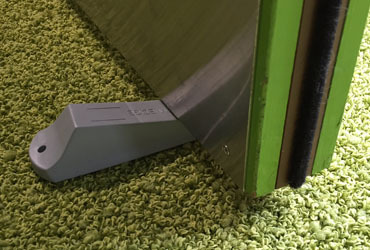 The other drawback is that as the attractive design is created between the contrast of the satin stainless steel and hard wood when together, this is lost when the doorstop is in use, and if you were to lose the wedge forever and couldn’t replace it then the overall attractive appearance would also be lost as well. There are a couple of simple solutions to the issues mentioned and no doubt the designers are already considering such as part of the production version. A removable doorstop that is tethered to the handle by a retractable cable/lead so it can’t be lost, and a doorstop fitted within a permanently fitted hard wood wedge within the lever so the attractive contrast isn’t ever lost.